The TNA and the Global Tamil Forum (GTF) have called for full implementation of the Consultation Task Force on Reconciliation Mechanisms (CTFRM) proposals made in accordance with Geneva Resolution 30/1, unanimously accepted in Oct. 2015. The next Geneva sessions are scheduled for March, 2017. Both the TNA and the GTF pointed out that the 11-member CTFRM had been appointed by the government in January 2016 and engaged in comprehensive consultation process before making its recommendations. Describing their recommendation for foreign judges and other foreign experts as the main contentious issue, Jaffna district MP and top TNA spokesperson M.A. Sumanthiran underscored that the vast majority of those who had been consulted hadn’t demanded exclusive foreign judicial mechanism. “Instead, they accepted foreign participation in Sri Lankan mechanism,” MP Sumanthiran told The Island yesterday. The MP’s response was the first on behalf of the TNA since the CTFRM handed over its report to the government on January 3, 2017. The CTFRM comprised Manouri Muttetuwegama, Dr Paikiasothy Saravanamuttu, Gamini Viyangoda, Prof. Sitralega Maunaguru, Dr Farzana Haniffa, Mirak Raheem, Prof. Gameela Samarasinghe, Visaka Dharmadasa, Shantha Abhimanasingham, PC, K.W. Janaranjana and Prof. Daya Somasundaram. CTFRM member Viyangoda told ‘The Island’ that comprehensive recommendations related to the proposed judicial mechanisms dealt with the need for international expertise, including judges in each transitional justice mechanism, both male and female judges representing all ethnic communities and a special structure for women and children during examination of witnesses related to sexual crimes and crimes against children. MP Sumanthiran underscored that the four-party alliance hadn’t been involved in the consultation process, though the grouping believed the recommendations could pave the way for genuine reconciliation process. Having proposed to restore special concessions under GSP plus tariff concessions for imports from Sri Lanka in exchange of an improved human rights and labour record on January 11, 2017, the European Commission underscored the European Parliament and the Council have now up to four months to raise potential objections before the measures become effective. Commending what he called a noble noble effort undertaken by distinguished representatives of all communities selected and agreed by the government, Surendiran said that the recommendations had been made on the basis of consultations, they have had with a cross section of people. Therefore, though some ministers and members of parliament had objected, the GTF believed the top leadership would take tangible measures. Former President Chandrika Bandaranaike Kumaratunga accepted the CTFRM report at the presidential secretariat on behalf of the yahapalana government. The GTF pointed out that the report had been released ahead of the next Geneva sessions in March. Surendiran said that UNHRC chief Zeid had welcomed recommendations, especially the clear backing of a hybrid court with local and foreign judges. They commended Muttetuwegama’s team for recommending several confidence-building measures ranging from the expedited return of land held by the military, to the release of a list of all detainees and detention centres, the repeal of the Prevention of Terrorism Act (PTA) and the immediate release of persons held under the PTA without charges. The report recognised the urgent need to address lingering concerns of militarisation, enforced disappearances and livelihood opportunities to promote reconciliation. The GTF said: “The panel’s finding that ‘foreign participation is required as those who suffered during the conflict had no faith in the local judiciary which lacked expertise to undertake such task’ very much resonates with the victims of the Tamil community. 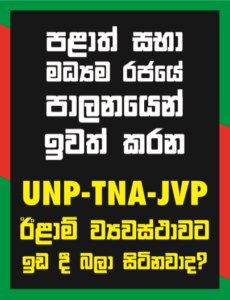 This is a long-standing view that is further reinforced with the recent verdict on the murder case of TNA MP Raviraj.